SOURCE DAILY MAIL: HSBC arm 'helped clients evade taxes' as thousands of clients including celebrities and sports stars hold secret Swiss accountsThe Swiss arm of HSBC, Britain's biggest bank helped wealthy clients such as sports stars, celebrities and politicians evade huge amounts of tax, according to an investigation by journalists. 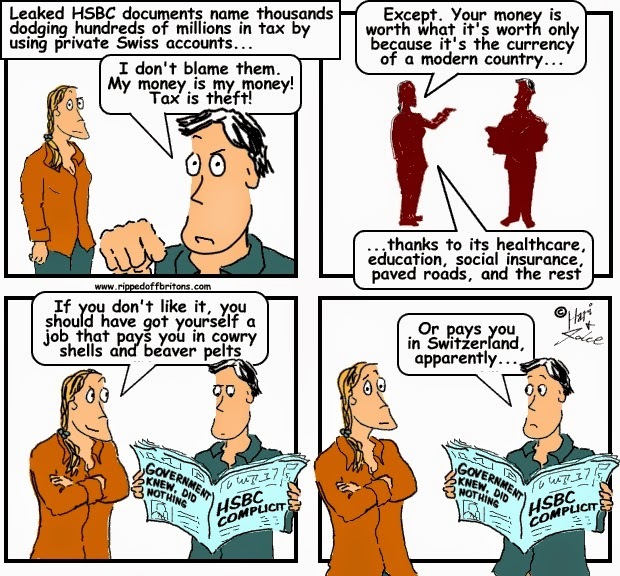 The Guardian newspaper and the BBC's Panorama programme analysed details of 30,000 thousand accounts holding nearly £78billion worth of assets and say they found evidence of secret Swiss accounts being used to help clients deliberately conceal assets from tax authorities. Holding a secret bank account is not itself illegal, using such accounts to deliberately conceal assets in order to evade tax is against the law. The leaked documents have already prompted a series of criminal probes in several counties. In the UK, HM Revenue & Customs, which received the data in 2010, has clawed back £135million from over 3,600 Britons. But it has faced complaints from MPs over the pace of progress and the fact that only one evader has been prosecuted. they let him steal the monies then conned it off him . 2012 - - - July. -- De – Spiegel. -- states – Pictet Bank uses a letterbox company in Panama and a tax loophole involving investments in London to gain German millionaires as clients. Ivan Pictet in Oct .2013--- Given the Legion of Honour --- but saying that --- the honour was given to Hitler ---Eichmann --- Mussolini --- Franco --- he's in fitting company – so there. April.2015.---- Inner City Press – United Nations Joint Staff Pension Fund. --" once a crook always a crook". It is also calculated that the secrecy " agreements" with regards to tax evation by their clients will cost the banks another £450 Billion. ( paid out of your monies. ).